Empathy and politeness have always been welcomed with warmth. So is the case when it comes to patients and optometrists. It has been proven that effective communication has made patients happy and satisfied providing improved outcomes. The ability to talk with parents of the patients. The ability to communicate sufficiently well with patients and parents so as to understand their concerns, problems, and beliefs, and to elicit relevant information. The ability to explain the child’s condition and its treatment. The explanation should be clear, complete, and in a language that the parents can easily understand. The treatment options should be explained clearly and completely, so that they can make informed decisions about treatment. The ability to convince parents to follow a treatment plan. The ability to establish a relationship with the parents and child, based on mutual respect and trust. Soft skills like being able to put all classes of parents at their ease, being able to generate confidence, and being comfortable holding conversations on non-medical subjects with parents and patients. Good form of communication can lead to better results like patient satisfaction, regular visits, referrals, sense of empowerment and control, adherence to treatment plans, loyalty and patience if the treatment does not have an immediate effect. 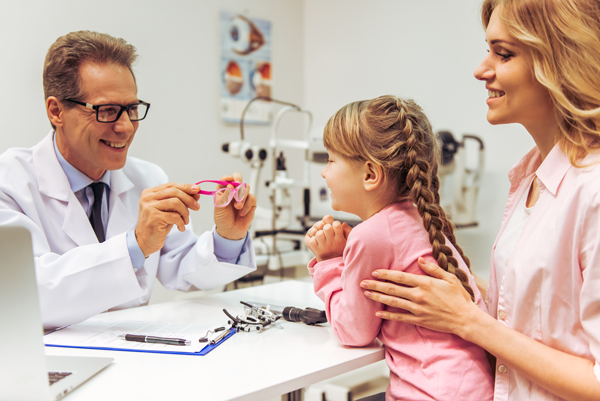 When it comes to being a good communicator, an optometrist should be able to provide what the patient really needs. Like, clarity and directness, good listener, honesty, more and better information about their condition, treatment plan, and expected outcome, openness to explain the side-effects of the treatment, more information on the relief of symptoms, advices on self help, information on alternate treatments, support and most importantly empathy. It may not be the easiest to handle the patients who suffer from a disorder. There are chances they will be arrogant and shy. The optometrist must be able to handle these behavioural issues with ease. Sometimes when they are shy, they need to show and make them realise that it’s for their own good and the optometrist is only to help. Assess the knowledge of the parents’ regarding the matter, as there is a chance of slight misconception of the matter. Understand the desires of the parents and communicate accordingly. Give enough time to the parents to process the information, sink it in, absorb and if required, repeat. Build and ensure confidence into the parents regarding the same. Tell them the truth, temper it with empathy but that’s what they deserve to know. Parents react in various ways, and we should be ready to deal with these emotions with understanding and support. Communication skills with some personal touch lead to better patient/parent satisfaction and perhaps better clinical outcomes, commercial success, less stress, and more job satisfaction.